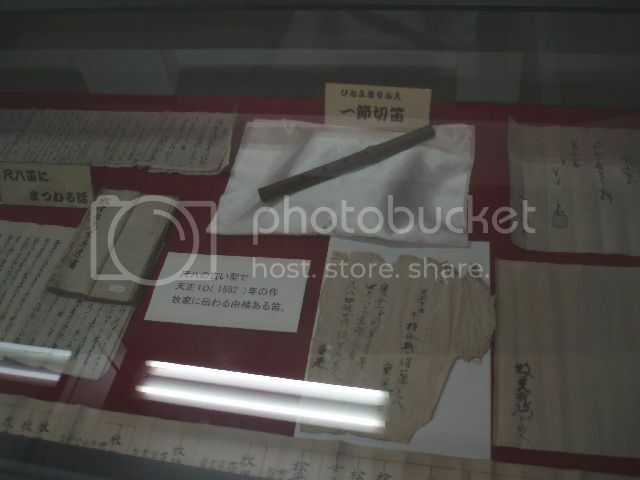 I was traveling in Nagasaki prefecture last week and on a visit to Shimabara Castle, I came upon this display case with what is reported to be a 16th century hitoyogiri. Though not allowed officially, I snuck a photo to show you all. I had the opportunity to play some of these vintage hitoyogiri and the experience was not pleasant. However there are a few recordings I've heard that still make me interested in it. I haven't, but have heard similar stories. Wow, really nice I have read that Dan Shinku still build such flutes right? Yes, in fact his recordings on it are nice. But I wouldn't know if his hitoyogiri are similar to the vintage ones or not without playing them. and a link to a site where the tuning is mentioned, (A→ C→ D→ F→ G→ A) ? Taro Miura also makes them. I didn't think to ask him about them when I visited him in June. I am thinking of getting another shakuhachi from him, so maybe I will get a hitoyogiri at the same time. What a dandy little website. His flutes are so inexpensive. I know nothing about him. Is he a good maker? thanks for the link. very cool. according to the text, the diagram is the measurements of the hitoyogiri that is said to have been Ikkyu Sojun's, which is pictured on the page as well. other link enlightening as well. the blogger, seifuu, seems to like some pretty obscure stuff! I bought one of his inexpensive flutes. A nice 2.0 jinashi that plays one note lower still. I should it to my teacher when I got back home and he thought it was pretty nice. Miura was sure to let me know that the jinashi are his low end flutes. He let me play one of his jiari flutes and it was amazing. As was the price. Maybe some day. If this is correct, it's in line with the extremely sharp chi we find on many older shakuhachi. Which might explain why those flutes are like that but does not explain why the pitch of 4 went down later in history. Maybe because in the melodic lines the perfect 5th used to appear more than a sharp 5th, resulting in a constant need of "correction" while playing, so they decided to choose by one of the notes? In my modest opinion, the "middle way" chi - not a perfect 5th nor a sharp 5th - is really cool allowing for playing the same notes with more fingerings.